Thanks for stopping by! Today, members of the ODBD Design Team are sharing new inspiration using the products from the October 2017 Release. 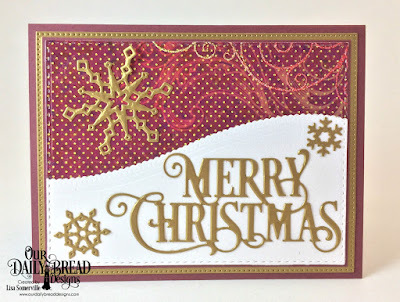 Today I'm sharing two cards that use the Christmas/Rectangle die sets, Card Greetings stamp set and Coordinating Christmas 2015 paper collection from the October Release, along with additional ODBD Custom Dies and paper collections. Please see my complete supply list below. My first card uses the beautiful Ornament Branch die as the focal point of my card. The die was die cut two times in order to get the different colors for the branch and ornament. 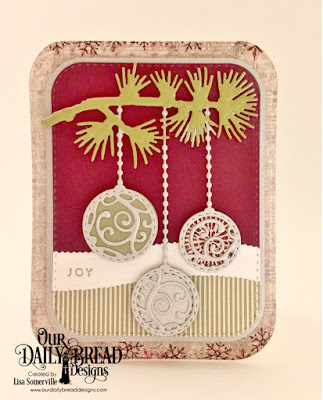 I then used the ODBD Circle die sets to die cut circles from pattern paper/card stock to give the ornament a colored look. The shaped card was created using the Rounded Rectangles die set, I used additional dies for layering panels, also adding a panel die cut using the Double Stitched Rectangles die set. I used the omitting stamp technique to Silver emboss the word "joy" from a sentiment from the Card Greetings stamp set. My next card uses the Merry Christmas Caps die as the focal point of my card. I used die cut snowflakes from the Snow Crystals die set to embellish my card.